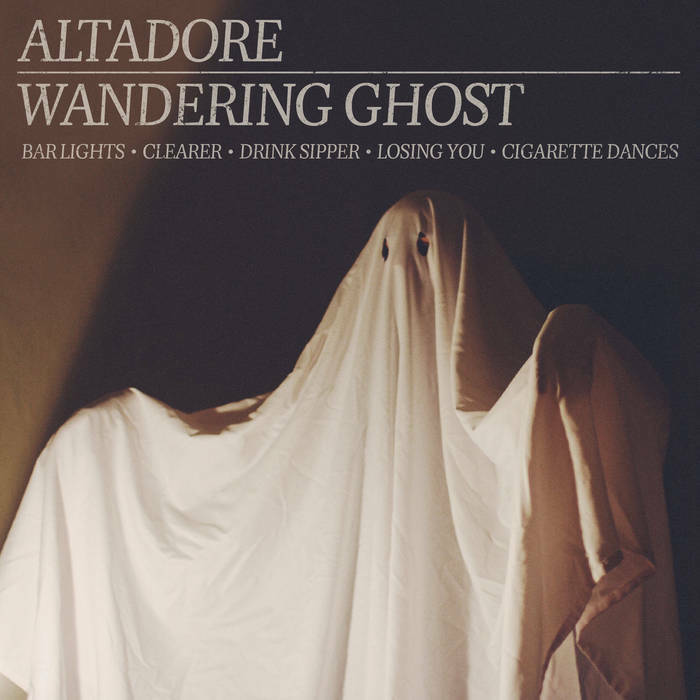 Altadore, an emerging rock band out of Portland, OR, released their second EP album last month Wandering Ghost which isn’t a drastic departure from their 2012 effort Golden Hills but certainly takes the band in a different direction that fans should not only embrace but perhaps get the members a step or two closer to their goal of quitting their day jobs. The five song album from the quartet that consists of band founder David Katz on lead vocals, guitar, and keyboards; Gabe Mouer on lead guitar, background vocals and keyboards; Matthew Hall on bass; and Zach Wilder on drums, brings a stronger rock vibe and sweeps away, just a bit, that softer indie quality that made up their first release. Recorded at Portland’s Marmoset, it’s evident from the opening tract, “Bar Lights,” that Altadore is reaching for new heights with a catchy guitar chord to start things off followed by Hall’s rolling bass, and then Katz’s vocals pipe in taking charge and making an immediate impact, sounding raw yet subtly refined. “Clearer” is the most pop-oriented and personal of the group, a love letter of sorts that again is driven by Katz’s vocals and you immediately know where he’s headed from the start: Darling, how could you not recognize my love?/Darling, how could you not justify my love? It’s overtly catchy with a great melody and even the background guitar loop that seemingly fades in and out throughout the course of the song helps cement the arrangement. “Drink Sipper” carries a shade of Golden Hills with Katz vocals a bit softer and an overall more melancholy vibe to the instrumentation. “Losing You” feels like it’s headed in a similar manner starting off slow as Katz is accompanied by just a soft guitar strum but then suddenly the rest of the band breaks in with an upbeat tempo that takes the song in an entirely different direction. It’s a fun tune that offers some musical complexity and allows Hall to rock out a bit. Finally, “Cigarette Dances” could be on a “Time Life” baby boomer’s compilation disc as Altadore embodies The Everly Brothers’ “All I have to Do is Dream” and even the title suggests a song favorite your Mom and Dad slow-danced to in the high school gym but that’s about as close as it gets especially with these lyrics: When I figure it out, will I still be here?/Or will I be a wandering ghost?/Will you read my eulogy? Katz said the album is not as personal as their last effort as the content is more fiction than truth however the subject matter of fleeting love and inner turmoil should resonate for anyone with a pulse. Overall, the vocals step up this go-around as a main instrument rather than a complement to the rest of the band and Katz said in many respects that was deliberate as he was trying for a “slap-back delay” that resembled a hifi tone often heard from 1960’s Motown tracks. Check out the full EP below and a profile of the band.